So lovely John. Your vivid descriptions filled with details help me imagine that I too am part of your “spiritual story”. Thanks for coming along, Donna. Reading of your devotions brings me such pleasure and memories of growing up in my beautiful Anglican Church. And your disconnect … also a part of my story, but an irreparable one. Lately I have been writing some spiritual memoir, so renewing my connections to other seekers and celebrants, and shining a light on what was and is best about the whole experience, in or out of church. I will be thinking of you tonight at your vigil. Blessings on the journey, John. Thank you, Cari, I appreciate your blessings. And I think of these things often, too, and find I walk an interesting balance: these things are of my heritage but I am an outsider, too. Yesterday’s sermon did not make me uncomfortable for political reasons but for the nature of what the priest chose to talk about: a graphic explanation of the suffering that comes with crucifixion. Perhaps we needed to hear that, I don’t know. As Father Seamus once told me: “This church is as much yours as anyone else’s.” I keep that in mind as I hear words come out of the mouths of some who are more conservative than he is and I hold what is valuable to me and let go what is not. I am myself always and live my life openly. I guess I just do the best I can; hopefully everyone else will, too. Thank you, Carl and Kathleen. Buona pasqua! It’s great catching up with you via the blog, John. 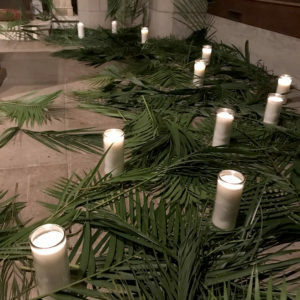 Your approach to the seasons and to the ritual experience is so different from what I would usually see at Easter time in my old Greek Othodox church (a lot of grumpy Greeks pushing past each other to get to the Eucharist). (But I kid.) As always, reading your posts reminds me of how important it is to be mindful of how the seasons and so much of life comes and goes.